Cavtat is probably the most southerly Croatian resort of all, located around 20 km south of Dubrovnik and only 22 km from the border with Montenegro. Cavtat is an exceedingly pretty town, and is a great place to base yourself in if you’re after all the sights and culture of Dubrovnik but don’t want the hustle and bustle. It is very easy to travel between the Cavtat to Dubrovnik. Cavtat is very easy to reach from Dubrovnik – local bus number 10 is run on this route, with a bus running approximately every hour. See the schedules on the Dubrovnik Bus Terminal website. You can also travel between the two by boat – ask locally for details. Cavtat is actually very close to Dubrovnik Airport. If you’re flying in it’s an easy taxi journey to the town from the airport, which is only 6km away. The House of Vlaho Bukovac is a museum (and, in fact, his actual home at one point) dedicated to this Croatian painter who was born in Cavtat in 1855. Well travelled in his early years, he started his artistic career in Paris, training at the École des Beaux Arts before exhibiting his works in the city. Returning to Zagreb in 1893, he became an important figure in the Croatian art scene in the latter part of the 19th century, organising a number of important cultural and artistic events and working alongside a number of other Croatian young artists working. In 1903, he left to become Professor of The Academy of Fine Arts in Prague and he died in that city in 1922. As well as viewing Bukovac’s works, you can also see frescoes in the house painted by the teenage artist. The Racic Mausoleum was built in 1921 to a design by famed Croatian sculptor and architect Ivan Mestrovic using stone from the island of Brac. The Racic family were a well known ship-owning family from the town. The Baltazar Bogisic Collection in the Rector’s Palace contains items from the collection of this Cavtat-born lawyer (1834 – 1908), including books, notes, coins and more. Cavtat is located in the region of Konavle, which has a rich cultural history. Folk costumes, embroidery and traditional dances are also an important feature of the region. These can all be seen in person in the village of Cilipi where on Sunday mornings (in spring/summer/early autumn), locals in traditional costume gather in the main square to sing and dance. Cilipi is about 8km away from Cavtat, and local bus 11 runs between the two. Ask locally for bus schedules. 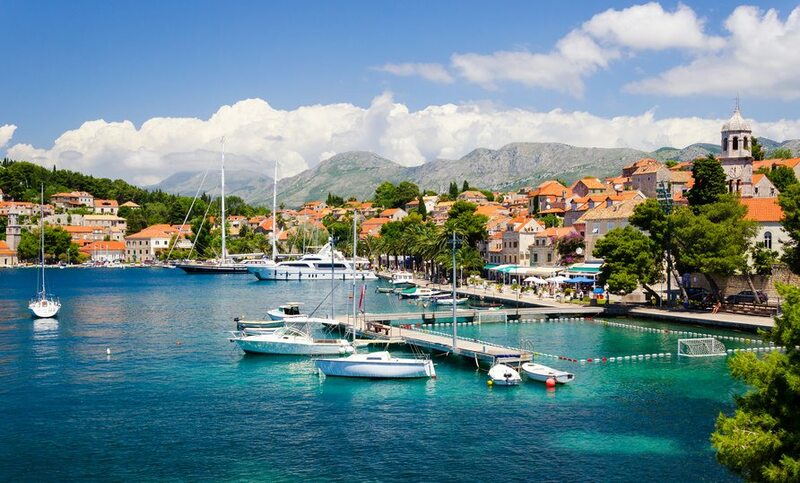 There are a number of hotels – including boutique ones – in the town, from the five-star and modern Hotel Croatia to a smattering of three-star ones. Private accommodation is also available; see full details on our Accommodation in Cavtat section. More information can be found at the Tourist Board of Konavle section on Cavtat.